Some microorganisms are harmful, while others cause illness—for instance, parasites are microorganisms that can cause damage after finding a host. A parasite is also a person that exploits others. There are over 1,000 types of parasites that can live within the human body. On the other hand, someone with a parasitic nature can also be defined as an opportunist that takes advantage of others at the right time. Daraprim (pyrimethamine) is the standard drug used to treat a life-threatening parasitic infection called toxoplasmosis. It has been on the market since 1953. In August of this year, Turing Pharmaceuticals acquired the drug. Shortly after, the price of the drug had skyrocketed from $13.50 a tablet to $750.00 per pill. That is a 5,000% increase! Some doctors who treat infectious diseases are even criticizing the new price increase. Dr. Judith Aberg is the chief of the division of infectious diseases at the Icahn School of Medicine at Mount Sinai. Dr. Aberg believes the increase could force some hospitals to use less effective alternative therapies. Many high priced drugs fall into the “specialty” category that will require patients to pay hundreds to possibly thousands of dollars each year. The cost would still be $150 a pill for those with insurance plans that require 20% of the payment. What does Turing Pharmaceuticals have to say for themselves? A Turing spokesperson says the company is also working with hospitals and insurance providers to get coverage for every patient, including free-of-charge options for uninsured patients. The company also plans to use the money earned from the Daraprim price increase to invest in toxoplasmosis research and education tools to spread awareness of the disease. However, since the original story hit, Turing has agreed to make the price of Daraprim more affordable. Toxoplasmosis is caused by the single-celled parasite called Toxoplasma gondii. The parasite is thought to affect three billion people around the world, and over 60 million Americans. The disease can occur from drinking unclean water, eating undercooked meat, cooking with contaminated boards and knives, and making contact with infected cat feces. Toxoplasma gondii is a common parasitic disease that can affect nearly all warm-blooded animals and humans—but cats are the primary living host. The infection will also target pregnant women and those with impaired immune systems, including people with AIDS, people taking certain types of chemotherapy, and those with a recent organ transplant. Most people with a strong immune system are often unaware they have contracted a toxoplasma infection; however, others may develop symptoms and signs that resemble the flu such as fatigue, fever, headache, body aches, and swollen lymph nodes. People can develop severe toxoplasmosis from an acute toxoplasma infection or an inactive infection that had occurred earlier in life. The severe infection will cause damage to the eyes, brain, or other organs. Symptoms and signs related to a severe infection include poor coordination, confusion, headaches, seizures, or lung problems that resemble tuberculosis or a common infection in people with AIDS called pneumocystis jiroveci pneumonia. Blurry vision, reduced vision, and redness in the eye caused by severe inflammation in your retina will produce ocular toxoplasmosis. Want to know how to get rid of parasites naturally? Alternative natural supplements, herbal remedies, and foods can help treat and prevent a toxoplasma infection. Black walnut (Juglans nigra) is considered an effective herb against toxoplasmosis. It contains natural tannins that fight fungus, yeast, and parasites. According to a recent study published in the journal Experimental Parasitology, a chemical found in black walnut called juglone exhibits antibacterial, antiviral, anti-cancer, and anti-parasitic properties. Research has found that black walnut is effective against up to 100 different parasites in the body. Black walnut also contains the chemical hydrojuglone that has an anti-parasitic effect. Garlic (Allium sativum) supplementation is the perfect treatment for toxoplasmosis. The remedy has antimicrobial, antibiotic, antioxidant, antibacterial, antifungal, anthelmintic, and anti-parasitic properties. Garlic cloves, garlic tablets, and garlic juice can all help prevent reproduction of parasites like toxoplasma. Nutmeg (Myristica fragrans) is the seed kernel inside the fruit of the nutmeg tree. Nutmeg essential oil showed significant inhibiting activity in an in vitro anti-Toxoplasma gondii assay during a study presented at the third International Conference on Biotechnology and Food Science. The result was considered comparable to the standard antibacterial drug clindamycin. Oregano (Origanum vulgare) essential oil contains a monoterpenic phenol isomeric called carvacrol. It is known to display many protective activities such as antitumor, antimicrobial, antibacterial, insecticidal, and anti-parasitic. Oregano oil also contains another potent substance called thymol that has been found to treat parasites. Toxoplasma-gondii remedy is a homeopathic dilution produced from the cysts of the parasite. In a blind, controlled, randomized study published in the European Journal of Integrative Medicine, researchers found that the homeopathic remedy reduced the number of bradyzoites and cysts in the brains of toxoplasma gondii-infected mice. Other homeopathic remedies for parasites include cina, teucrium, spigelia, sabadilla, natrum phosphoricum, filix mas, cuprum oxydatum nigrum, granatum, and tanacetum. What are other natural remedies for parasites and toxoplasmosis? In a 2010 study published in Parasitology Research, thyme essential oil showed a blocking effect on toxoplasma gondii cysts in mice. Other remedies that fight parasites include goldenseal, peppermint, rhubarb, propolis, probiotics, grapefruit seed extract, coptis, wormwood, Oregon grape root, pau d’arco, male fern, clove, turmeric, psyllium husks, aloe vera juice, coconut oil, restharrow oil, horsetail oil, Croton cajucara oil, epazote, cinnamon stick, and black seed. Cook whole cuts of meat at a minimum of 145 degrees Fahrenheit, and allow for three minutes of rest time before consumption. Ground meat should be cooked at 160 degrees Fahrenheit, and no rest time is required. The cooking temperature exception is poultry, which should be cooked at least 165 degrees Fahrenheit. Three minutes of rest time is also required. Chance of infection is significantly reduced from freezing meat for several days at sub-zero temperatures. Wash or peel fruits and vegetables thoroughly before consumption. After coming in contact with raw poultry, meat, seafood, or unwashed vegetables and fruit, always wash counters, utensils, dishes, and cutting boards. Oysters, mussels, or clams should not be eaten raw, since they may be contaminated with Toxoplasma from seawater. Always wear gloves when gardening or contacting soil or sand. Afterwards, hands should be washed with warm water and soap. Pollack, A., “Drug Goes From $13.50 a Tablet to $750, Overnight,” The New York Times web site, September 20, 2015; http://www.nytimes.com/2015/09/21/business/a-huge-overnight-increase-in-a-drugs-price-raises-protests.html?_r=0. Pearson, R.D., “Toxoplasmosis,” Merck Manual Professional Version web site; http://www.merckmanuals.com/professional/infectious-diseases/extraintestinal-protozoa/toxoplasmosis, last accessed September 25, 2015. Rushton, C., “Company hikes price 5,000% for drug that fights complication of AIDS, cancer,” USA Today web site, September 18, 2015; http://www.usatoday.com/story/news/health/2015/09/18/company-hikes-price-5000-drug-fights-complication-aids-cancer-daraprim/32563749/. 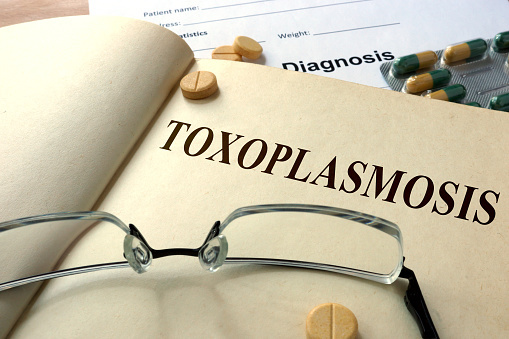 “Parasites – Toxoplasmosis (Toxoplasma infection),” Centers for Disease Control and Prevention web site; http://www.cdc.gov/parasites/toxoplasmosis/gen_info/faqs.html, last accessed September 25, 2015. Jha, B.K., et al., “Juglone induces cell death of Acanthamoeba through increased production of reactive oxygen species,” Experimental Parasitology, 2015, doi: 10.1013/j.exppara.2015.09.005. Braga-Silva, C.F., et al., “Homeopathic remedy made from Toxoplasma gondii reduces the number of bradyzoites in mice infected by the protozoan,” European Journal of Integrative Medicine, 2015, doi: 10.1016/j.eujim.2015.05.002. Pillai, S., et al., “Anti-parasitic Activity of Myristica fragrans Houtt. Essential Oil against Toxoplasma Gondii Parasite,” 3rd International Conference on Biotechnology and Food Science, 2012, 2, doi: 10.1016/j.apcbee.2012.06.017. “Toxoplasmosis,” Mayo Clinic web site; July 24, 2014; http://www.mayoclinic.org/diseases-conditions/toxoplasmosis/basics/symptoms/con-20025859. Baser, K.H., et al., “Biological and pharmacological activities of carvacrol and carvacrol bearing essential oils,” Current Pharmaceutical Design, 2008; 14(29): 3106-3119. Dahbi, A., et al., “The effect of essential oils from Thymus broussonetii Boiss on transmission of Toxoplasma gondii cysts in mice,” Parasitology Research, 2010; 107(1): 55-58. “10 Herbal Remedies for Toxoplasmosis,” Health N Fairness web site; http://www.healthnfairness.com/2015/03/10-herbal-remedies-for-toxoplasmosis.html, last accessed September 25, 2015. Balch, J., et al., “Prescription for Natural Cures: A Self-Care Guide for Treating Health Problems with Natural Remedies Including Diet, Nutrition, Supplements, and Other Holistic Methods,” (Hoboken: John Wiley & Sons, Inc., 2004), 424-428.